Saw Boss 6" Heavy Duty Circular Saw, Double Insulated, 120V, 9A, 6,000 RPM, Cuts 2x Lumber At 45ree. Bevel In 1 Pass, Left Hand Blade Replacement For Best View Of Cutting To A Line, Dust Pick-Up Bag & Vacuum Attachment Options, Compact Size & Lightweight, Spindle Lock For Easy Blade Changes, Positive Stops At 45ree. & 90ree., "Miter-Lip" Telescoping Guard ForS mooth Action Even On Compound Miter Cuts, Anti-Splinter Base Insert, All Ball & Needle Bearing Construction, Includes 20 Tooth Carbide Tipped Blade,B lade Wrench, Dust Nozzle, Base Insert & Operating Manual. I bought my Saw Boss back in 1995 to use while restoring a condemned house we bought in North Carolina. I can't imagine the number of boards I've cut with it. When used on a bench it cut through every piece of wood with ease, as long as I used blades that hadn't already been used to cut through TOO many nails. The reduced power (when compared to a 7 1/4 saw) was a major asset when I had to use the saw in awkward positions cutting away bits of old house. The saw would bog down before anything seriously dangerous happened. Being light, the saw could be used in a vertical position to cut through wall boards, and I even used it overhead with ease. The saw did not have a safety interlock which would have made it impossible to use for some of the cuts I needed to make. I don't know if the newer saws do, but I doubt it since this saw is designed for professionals. I, also, have some complaints with the stamped metal base, but in its favor, I dropped the saw from the roof of the porch once and bent the plate and was able to hammer it back into shape. An aluminum plate would surely have broken. My point is, this saw really shines when used for construction and remodeling work, for making repeated cuts in a number of awkward positions. You don't get worn out just lugging the saw around. This is a perfect outdoor tool, even coming equipped with an extra-long cord. I can't speak for the shop, since in there I generally use my Dewalt chop box or Jet table saw. Update a few years later: It is now 2007 and I've had the saw for 12 years. Just used it to build my first boat. Works as well as ever. I used it mainly to rip 8' sheets of plywood. Everytime I do it I thank Porter-Cable for the extra long cord. A couple years ago I finally got tired of looking at my almost straight base which gets bent periodically when I drop it off the deck or whatever. Had to go to the Porter-Cable folks to order one for $25 or so and put it on by myself. It looks nice again. I've now had this saw for 3 years and can say that it is a poorly designed and very cheaply built tool. The sole plate is a formed piece of sheet metal that is severely warped on the diagonal. There is no way to square saw blade to the sole plate. Consequently, it is impossible to get a perpendicular cut. The sole plate is formed sheet metal, therefore it has a radius on all four edges. This makes it impossible to use a carpenters square or any similarly thin straightedge as a cut guide. If you try, the radiused edge of the sole plate rides up the straightedge, and you loose use of the guide. In a full depth cut, the motor sits within 3/16 of the cutting surface. This requires a thin straightedge (carpenters square) if you want a guide for the cut, but the sole plate radiused edge rides up the straightedge. So, it's a catch twenty-two. The bent metal rip guide is next to useless. On the plus side: The motor is strong, but loud. The saw is double insulated. The saw blade guard works very well. In 1992 after finally realizing that a cheap circular saw wasn't worth the bother, I bought a Makita 5007NB which was great for pretty much everything. Then I learned about Porter-Cable and how well they design their power tools, especially for the professional woodworker. When I found out about the Saw-Boss I was impressed with the built in system for dust collection, its lower weight, and how well it cut with its 9 Amp motor. Porter-Cable chose the 6 inch blade as the smallest size which would still cut 2X lumber through at 45 degrees. And who else would give you an anti-splinter insert, lever locks, and angle zeroing screw as standard? When Bosch wanted $30 for a rip fence for my Model 1654, the Saw-Boss fence was available for less than $10 at my local Home Depot. I went in to cut off eleven closet and bathroom doors in a luxury condo where the owner had put in extra thick padding with new carpeting and couldn't move any doors at all. Because I had my Saw-Boss with dust bag, I was able to get the work done without spending two additional hours cleaning up all the wood dust. And it saved me from considering the task of hauling all eleven doors thirty flights down to the outside where I could afford to make a mess. The owner was watching me too, and she was mighty impressed that I was so neat and tidy. The only drawback to the Saw-Boss is that the premium blade makers have ignored the 6 inch size. You can buy a plywood, 18 tooth carbide, and a 40 tooth carbide blade from Porter-Cable and that's about all. Looking at the bright side, however, these blades from P-C are excellent and pretty much do everything for me that I need. I bought this saw before just prior to starting my house construction project. 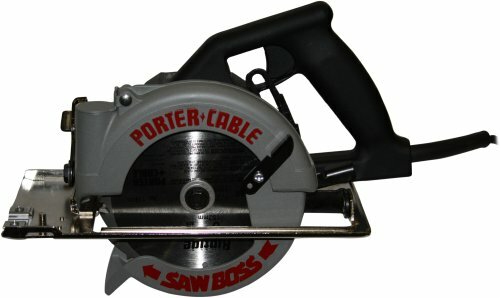 This saw, like most all Porter Cable products, is a well engineered, powerful tool. It is mid/light weight, but has gobs of power. I notice some reviews that are disappointed with the power of this saw - my guess is wet binding lumber is the culprit. Great saw. I have had this saw for more then eight years and love it even the blade that came with it was very good, some people say it dosen't have enough power but i haven't found that to be true it cuts a 2x4 with out a hitch in fact one time i was cuting 3x4 partical bord on my steel porta horse saw horses and didn't have my cut line off to the side and it cut thru the top of one of them it felt like the blade was binding up untill i saw sparks. any way 2x on top fixed that. also everyone that tries it is impressed i also owen a skill mag worm drive but i seldome us it now. p.s. the blade that cut the saw horse still cut well after that. I've had this saw for about 6 years now and have grown to love it. 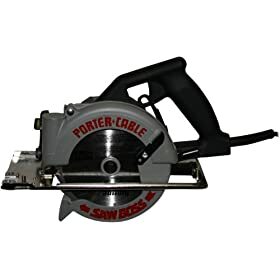 I've always used 7 1/4" saws, usually worm drives, but after doing a remodel a few years ago with a friend of mine who had one of these saws, I had to get one for myself. At first I wasn't sure because it is so light and I was not sure if it would hold up over time. Well, after a lot of use and and a few saw blades, it is the first saw I usually grab when planning a job. Like any saw, keep the blades sharp and it cuts like butter. Use the bigger saws for heavy loads like 4X material and you'll be happy. Great little saw! I bought this saw back in 1996 and I don't think I could be happier with it. Being that 99.9% of the time I cut nothing more than sheet goods or 2x material at 45º the small size and light weight of the Saw Boss is perfect for me. That being said and as much as I love and recommend this saw if you often have the need to cut stock of thicker dimensions than the Saw Boss is capable of then obviously a good 7 1/4" would definitely be the way I' go. The strong points of this saw are most importantly the small size, light weight and right-hand drive. In my younger days on jobsites I "prided" myself on being "the man" slinging around heavy tools like they were nothing but in my older and much wiser days I truly appreciate the virtues of something smaller and lighter but still as capable. This saw is an absolute pleasure to use and the right-hand drive gives us righties a perfect view of the cut line. As for negatives I personally don't have any. This saw, as with any and every tool, has limits and within those limits it excels. Some have stated the lack of blade options as a negative but I must disagree. Not only does Porter Cable offer an 18T rip and and 40T crosscut blade ( I have both and they are more than acceptable) but Freud also offers both a 20T rip and 40T crosscut blade. Truthfully, what more do you need for a circular saw? As for the comments about the saw being underpowered I honestly don't understand how that can be. I'm not out to call anyone a liar but any sort of 2x material is no match for 9 full amps and a thin kerf carbide blade - my personal experience has confirmed that repeatedly. All said and done if the majority of your sawing involves nothing more than 2x at 90º or 45º and/or sheet goods then I think you'd truly appreciate the beauty of the Saw Boss and I'd venture to say it would be a welcome addition to your gang box or garage but if you frequently saw anything out the the Saw Boss's limits then it, again obviously, would be a questionable investment for me or anyone. The 345 is a well sized circular saw for most jobs. The lefthand configuration provides great access for viewing the cut (but wear safety glasses), if you're a righthanded user. I bought my 345 used for $25, so I'm quite happy. If I had paid $140~150 for a new unit, I would be much less impressed. that I use regulary on any given job. The Porter Cable Saw Boss has the power to cross cut and rip 2 X matierial that I otherwise would have to use a worm drive drive saw to do. It,s the lighter weight and size that is so useful, AND THE BLADE IS ON THE LEFT SIDE of the motor, most saws of this type have the blade on the right side, the point is you can see what the blade is doing (if you are right handed ). My go to saw that is allways in the truck. Oh, and it's heavy duty biult TOO. Great light-weight saw for both contractors and homeowners. Not for framing, but very versatile for tight spaces. As always, Porter Cable is one of the best.